NAIROBI, Kenya, March 27, 2012 (ENS) – A wildfire raging in the Mt. Kenya National Park since March 15 finally has been contained by government agencies, military forces, local communities and environmental groups working together. Logs are still smoldering in isolated parts of the forest, according to the Kenya Wildlife Service. “We appeal to the public to volunteer information to government agencies on suspects who could be lighting these fires as well as report any outbreaks of new fires,” said KWS spokesman Paul Udoto. Teams of fire-fighters from KWS and Kenya Forest Service are monitoring the lingering fires and putting them out, said Udoto. Mt. Kenya National Park’s natural forest is on the UNESCO List of World Heritage. At 5,199 meters, Mt. 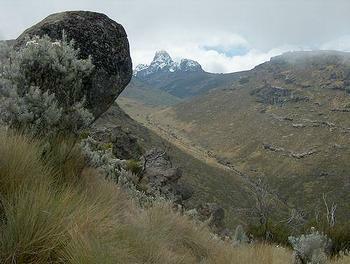 Kenya is the second highest peak in Africa after Mt. Kilimanjaro. The park is inhabited by thousands of species of wildlife, including some of Kenya’s most endangered, such as elephant, black rhinoceros and leopard. Udoto said the big mammals like elephants, buffalos, bush bucks and the primates have been moved away from the fire, but an unknown number of smaller animals were killed in the fire. 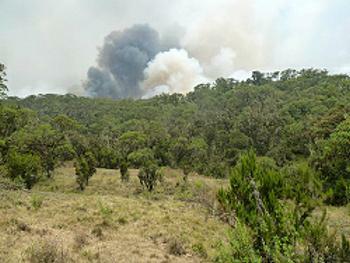 Two more wildfires burning in neighboring Aberdare National Park are also being contained by several teams. A total 130 people have been battling the fires. 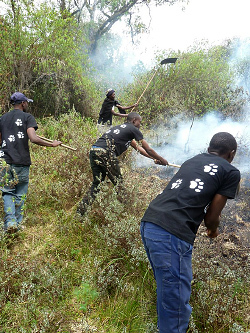 Volunteers include the British Army, Kenya Forest Service, the Kenya Police, Born Free Foundation and communities from Nanyuki, Gathiuru and Naromoru. “For over a week, the fire has given us sleepless nights, our men and women have had a serious battle with the ranging flames, it is not child’s play,” said Simon Gitau, deputy warden at Mt. Kenya National Park, welcoming volunteer firefighters from Born Free Kenya. “Kenya wildlife Service, Kenya Forest service, community members and the Mount Kenya Trust have been working hard to contain the fires,” he said. Victor Mutumah and David Manoa of Born Free Kenya volunteered to fight the fire in Mt. Kenya National Park and returned to blog about their experience. “Watching trees hundreds of years old burn to ashes was one of our most disturbing moments not to mention the thought of the animal lives that could have been lost,” wrote the two volunteer firefighters. Now, a substantial afforestation effort is needed to help the badly damaged ecosystem to recover, they suggest. It has been an active week for Kenya Wildlife Service rangers who have gunned down three wildlife poachers, rounded up 22 suspected poachers and seized pieces of ivory, firearms, ammunition, poison arrows, and vehicles. Three poachers have been gunned down and three firearms with 140 bullets recovered in separate incidents across the country over the past week. The three suspects from a poaching mission were shot dead in Isiolo County after a shoot-out with Kenya Wildlife Service personnel. In this incident, a firearm and nine rounds of ammunition were recovered. Also impounded were two motorbikes carrying 30 kg of ivory. At the same time, a total of 22 suspected poachers, including one woman, have been arrested and will soon be charged with wildlife-related offences in various courts of law across the country. Three vehicles, two motorbikes, two power saws, snares, weighing machine, 27 pieces of illegally acquired timber have also been recovered. Four pieces of ivory were also recovered. In two separate incidents in Meru, KWS team arrested three suspected poachers and recovered two firearms, 101 rounds of ammunitions and poisoned arrows. Three suspects escaped and are being pursued. In two other incidents in Nanyuki, four men and one woman were arrested with 30 rounds of ammunition, a pair of handcuffs and a vehicle carrying zebra meat. They had killed two zebras. Eight suspects were also arrested in different incidents in Narok and Trans Mara. Two power saws, a weighing scale, 27 pieces of timber and hunting gear were recovered. A vehicle was impounded in the Narok operation. In Tsavo, five people were arrested for illegally mining in the park and their vehicle impounded. In Trans Nzoia, four suspected bush meat poachers were arrested and a bicycle and hunting gears seized while in Nasolot one suspect was arrested with bush meat and poisoned arrows. Udoto said the Kenya Wildlife Service appreciates the help from the public, other law enforcement agencies, provincial authorities and other conservation stakeholders which has led to these successes in combating wildlife crime.